William Hill Your Odds - How to create and place your own bet! Introducing William Hill’s exciting feature #YourOdds. Bookmakers have just about every market covered in every football match or sporting event these days, there’s even an option to bet on a horse not to win a race – who thought we’d see a day when we were cheering on a loser? But it’s never enough. Have you ever had an idea for a great bet but couldn’t find the option in your local bookmaker, or online? That may be a family member to play for England or win a world title, or it could be a footy market that a rival firm offers, but yours doesn’t. So, what’s your options, go without the bet, look for something similar or go to a rival. Well, no more, as William Hill’s Your Odds allows you to request a bet, and get a bet. Simply contact them on Twitter @Williamhill using #YourOdds and put your point across – an outcome or market they don’t already offer and traders will look into getting it covered for you. This opens a world of opportunities, but from Hill’s point of view it also ensures you don’t have to check their rivals for a price. There’s even a #YourOdds section of the site currently available, which gives the ideas of fellow punters that you may just find interesting. Wouldn’t it be nice to see them price a unique bet you’ve thought up, make it available on their site, allowing others to get on, and it wins? Hills give a list of sports matches they look to cover in the Your Odds promotion, but we are confident they would extend this to whatever you had in mind. It is worth noting that William Hill say not every bet suggested by every customer will be given a price, and that’s acceptable, we’re sure they must get some strange ones sent in. 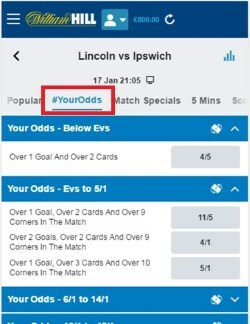 If you do have a bright idea for a bet however, that you believe will be popular, only suggestions made through the Twitter feed and #YourOdds will be given attention, so keep that in mind. This is just one of many features that make William Hill one of the top online bookies. If you’d like to learn more about them please check out our review. In there you’ll find the lowdown of the latest William Hill Promo Code which will bag you their current new punter offer when you join.